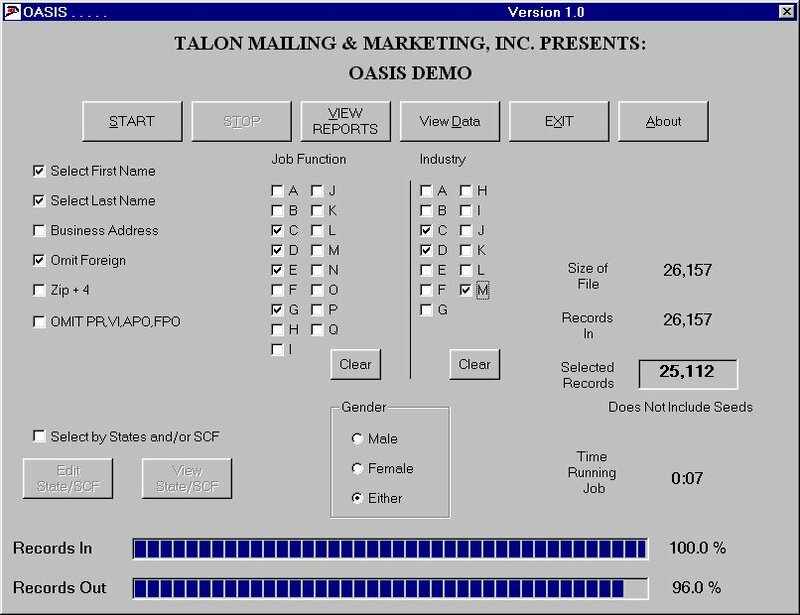 Welcome to the Talon Mailing & Marketing February 2016 Newsletter. 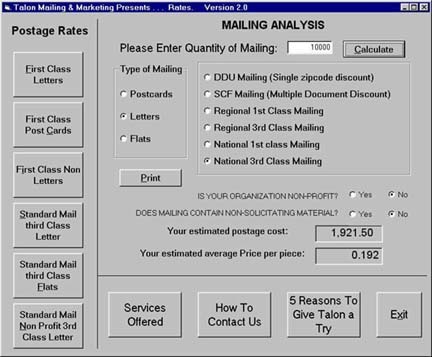 Direct mail can produce some of the highest conversion rates. The average campaign converts at a 4.4%, which is significantly higher than e-mail's 0.12% percent average. However, you can only expect these optimal results by running a smart campaign. 1. Not choosing the right prospects. You first step should be deciding who you are approaching in this campaign. Are you targeting new residents? Parents of young children? Choose your list carefully to assure that every cent spent on postage is used pursuing the people who are going to be most receptive to your message and product. A call to action feels like it should be the pay-off at the end of a lengthy and exciting buildup. Yet you should also have some sort of incentive for people to open, in the first place: Make sure that you have something to invite people into your mailing, and then another message near the top of your front page to incite them to keep reading and see what you have to offer. 3. Not personalizing your mailing. By personalizing a message, you have a much higher chance of getting someone to open it and respond. It starts by addressing the recipient by name. Mail addressed to a person by name instead of as "resident" is far more likely to be opened. On the inside of your mailing, speak directly to the person you are addressing. When people feel that an offering is relevant to them, they are more likely to respond. 4. Failing to tie in your social media presences. Make sure to mention your Facebook, Instagram or other relevant social media profile somewhere in your mailing. This way, prospects have the opportunity to stay in touch, even if they are not ready to buy. Over time, you can begin to build trust and familiarity that can convert into a lasting and profitable relationship. 5. Making it all about your product instead of prospects’ needs. Another way of thinking of this is features versus benefits. Don't only write about all of your product's specs and features. Your recipient doesn't know your product, and, frankly, has no reason to care. What the prospect does care about is what is in it for him. Start by talking about the benefits of your product and why it will solve a problem or enhance his life. It's impossible to improve if you don't know what you are currently achieving. In every mailing, use unique identifiers that can help track your success rate with measurable results. This can be a specialized landing page URL, a coupon code or a dedicated telephone extension. By tracking what works and what doesn't, you can continue to create more effective campaigns over time, increasing your direct marketing ROI. It can take several touches to close a sale. If you send one mailing and never contact that prospect again, you are dramatically lowering your chances of success. Send a remarketing campaign a few weeks after the original, and it will strengthen the initial offering. Every facet of your direct marketing campaign should be formed through careful deliberation and attention to detail. Consider hard questions about how you would feel about a campaign as the recipient, knowing nothing about your company. By seriously contemplating these answers, you can create the most appealing campaign possible, increasing your chance of closing the sale and building a fruitful relationship. The new year is here, and with it comes new opportunities to expand your marketing agenda, grow your customer base, and increase revenues. Whether you’re a small business owner, entrepreneur, marketer, or even freelancer, the following lists ten marketing resolutions you should make for 2016. Every business wants more customers, but we also know it’s far cheaper to retain a customer than to find a new customers. Never take your current customers for granted; instead, come up with clever ways to reward them for their loyalty. Make your customers feel part of your team, or family, and they’ll reward you with lifelong business. This goes hand-in-hand with customer retention and repeat business, but takes it a step further: think of ways you can get your customers to be brand ambassadors. What can you do that will make your customers feel your company is so amazing, they’ll just have to tell their friends, family, and co-workers about it? There’s no better marketing than word-of-mouth advertising, but you have to earn it. Once you’ve developed a customer retention and ambassadorship strategy, you can turn your attention to acquiring new customers. Of course, these things are done simultaneously at all times; but the point is to make sure you have your current customers accounted for first. How can you find new customers? By expanding your marketing and trying new marketing strategies. In effort to be progressive, many companies risk losing what they’ve built by abandoning tried-and-true customer acquisition strategies. If direct-mail postcards have worked in the past, it doesn’t make sense to cut into that budget in favor of Facebook marketing, for example. If you enjoy year-over-year growth, then your marketing budget should grow annually. It makes sense to allocate more of your budget into proven strategies, but also be sure to save some of it to try new marketing channels. It’s important to evolve with your customer base and always be on the lookout for new, lucrative marketing ideas. Don’t ignore how initial investment impacts your ROI. New technologies, alternative service providers, and more affordable marketing tools are constantly being developed. Stay abreast of alternatives and take time every quarter to survey the market to see if you can get the same services, at the same quality, for cheaper prices. A discount printing company, for example, might slash your printing costs in half without sacrificing quality – which would allow you either expand your marketing or instantly realize greater returns. Seek out non-competing businesses that share your target audience and see if you can come up with a mutually-beneficial package to offer customers. A restaurant, movie theater, and massage therapist could work together to offer a special “Date Night Package,” in which each offers a ten percent discount to offer couples reduced pricing on dinner, movie, and a couples massage. The three businesses could share marketing costs and also promote the packages individually. In this manner, you can reduce your marketing investment while tripling your reach, and still offer customers a discount. It’s a win for everyone! You need to be free to work your business and work on growing your business, not constantly implementing marketing campaigns. Hire employees or outsource work to contractors to write your blog posts, maintain your website, handle ad placement, and design your marketing materials (or, use free online design tools, which can also cut costs). If you use direct-mail, have your printing handle addressing and mailing so you don’t have to. The more you can free yourself to work on business growth, the faster you’ll realize your business goals. Many small businesses today still do not use analytics tools such as Google’s free Analytics or even coupon tracking. How can you know what marketing strategies are working so you can invest efficiently in business growth if you don’t know the numbers your campaigns yield? If you don’t have time or the inclination to learn analytics, hire someone who does (see “delegate whenever possible”). Once you achieve a certain level of success, it’s very easy to get comfortable right where you are. But if you truly want to grow your business, you’re going to have to constantly take risks. Risk should be calculated, no doubt, and not all will pan out – but if you don’t take risks, your business will stagnate. A few fails along the way are fine as long as you hit a few out of the park! What marketing resolutions will you make in 2016? "It’s important to review some elementary teachings that you’ve most likely forgotten along the way. Take a look at these five lessons below. Demand generation marketers spend their careers building out complex lead acquisition and engagement engines, but sometimes it’s good to take it back to the basics—way back–as in, back to the things we learned in kindergarten that still hold true in today’s marketing landscape. Just as the ABCs are fundamental to reading and writing, some of the basics like data, content, and segmentation are key to your lead generation programs. Chances are, with all the lead-gen pressures we face, it might be tempting to push best practices aside–which is why it’s important to review some elementary teachings that you’ve most likely forgotten along the way. No one wants to do business with a marketing loudmouth. Your customer doesn’t want to feel like you are mass marketing to them, but that you are engaging with them in a 1 on 1 conversation. You should strive to personalize your messaging when possible by segmenting your database out into personas. This will allow you to be more strategic in catering to each of your audiences, understand the customer that you are trying to attract, and relate to them as human beings. What’s better than a cold lead? A warm one! And this answer rings true for both marketing and sales. A “hand-raiser” is a warm lead, someone that identifies themselves as a prospective customer by opting to share their information with your company, usually with the understanding that they will be contacted. To increase your conversion rates, you should review your calls-to-action (CTAs) to make sure there is a clear value proposition and people know exactly what will happen after they click. Optimize your CTAs by testing out different creatives (design and copy) to find a winning creative that is both eye-catching and compelling. This can be done by A/B testing both your email and landing page content. Also, be sure to account for the audience personas you built out. While one CTA might perform well for one segment, it’s possible it can cause friction for another. Just as kids tend to get excited and want to run from point A to point B, marketers can have similar reactions with wanting to convert a newly acquired lead to a sale. Jumping into a hard sell too quickly is only going to push your prospective customers to want to make a run for it themselves, away from you! So map out a lead nurturing process to develop a relationship with your prospects and walk with them through their buyers’ journey. If you start off with smaller asks, like watching a video, attending an event, or signing up for a newsletter, you can create a pattern of behavior that makes it easy for your prospect to follow through with the final CTA, the sale. It’s all about the baby steps! This is one task that kids and marketers alike are inclined to put off, which never really does anyone any good. Your database is one of your organization’s most valuable assets. However, its value can quickly diminish if you don’t keep it clean. In order for your data to be actionable, it needs to be accurate and up-to-date, or it will cost you both time and money. In fact, neglecting to clean up your database can cost your company as much as 10-25% in revenue, according to information governance expert Larry English. Scary, huh!? Scrub dirty data from the start and standardize the data that comes into your system as often as possible. Make sure you validate email addresses at least once a year to get rid of inactive accounts that are most likely skewing your metrics and remove duplicate leads to get a clear picture of your audience size. We all know this “golden rule,” and it’s named that for good reason. It should be carried with us from kindergarten throughout our lives and into our careers. Remember that you are marketing to people, so put yourself in your customers’ shoes as you think through the engagement process. Are you emailing them too often? Are you providing appropriate content and offers? Are you helping them connect the dots on why they should buy from you? If you only think of things from your own perspective, you are most likely going to have a hard time growing and maintaining your customer base. As we kick off the New Year, now is the perfect time to reinstate those maybe forgotten best practices back into you lead generation plan. similarsitesearch.com - A search engine that generates similar, related or alternative websites for users. quantcast.com - Free direct audience measurement for all website owners including traffic, demographics, business, lifestyle, interests and more. powtoon.com - A free animated presentation tool that supercharges your presentations and videos! Save massive amounts of time and money by creating Powtoons that bring the WOW!-factor to product demos, business presentations, social media clips, and much more. phrase.it - Add cartoon style speech bubbles to photos within seconds. khanacademy.org - Learn for free about math, art, computer programming, economics, physics, chemistry, biology, medicine, finance, history, and more. Great for students! waivecar.com - The new service lets you use the WaiveCar app to find an electric car, book it, drive it around for free for 2 hours, and drop it off at certain spots. theplayerstribune.com - A new media platform which attempts to present a medium for direct reflections, thoughts and experiences of professional athletes.